The Formentera Council's human resources department reports that islanders keen to add muscle to Formentera's fledgeling vehicle regulation service and nautical sports centre (known as CENF for Centre d'Esports Nàutics de Formentera) will get their chance in a few days. In an effort to maximise the apparatus that will be charged with tracking the vehicles that enter, circulate and park on the island, the administration wants to enhance the current three-person team by adding a university degree-holding project operative. The individual selected for the position will be responsible for overseeing the day-to-day progress of the project as well as coordination with organisations and businesses affected by the measure. The Council will also seek to charge a technical specialist with coordination of the project's database and an administrative assistant to stay on top of new registrations. The administration is additionally looking for an individual with an advanced degree and knowledge of sailing to work within the soon-to-be opened CENF in la Savina, not to mention an IT specialist with an advanced degree in this area. Descriptions of the positions will be published in the coming days—CiF officials say before Easter—to the public sector section of the SOIB, the job seekers' service in the Balearics. The application process is digitised and can be completed online. In preparation for the summer season, between Easter and May the Formentera Council will build a pool of representatives to meet staffing needs at la Mola lighthouse, CENF and the island's “Tourism Info Sites” (Oficines d'Informació Turística), in addition to a catalogue of pre-screened blue zone parking attendants, inspectors, summer school staff and cleaning personnel. 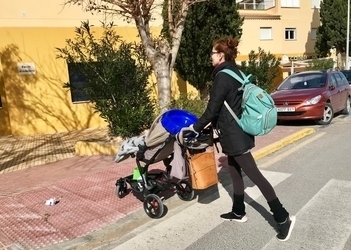 The Formentera Council infrastructure office reports that construction features making access difficult or impossible—also known as “architectural barriers”—were taken out at 10 pedestrian crosswalks around Sant Francesc. Infrastructure and mobility councillor Rafael González gave account of the changes today, seven of which happened along avinguda 8 d'agost, two on carrer Sa Senieta and one on Pla del Rei. González said picks of the crosswalks to be upgraded responded to requests by islanders with reduced mobility and the €32,468 (VAT included), one-month project was included in December's “Sustainable Mobility Plan” (Pla de Mobilitat Sostenible). The councillor said it has been the fourth operation to erase hurdles to mobility in the last three years. The first time, local associations requested and fast-tracked the upgrades as part of the island's “participatory spending” initiative. The second aimed to improve access to schools, and the third was performed on the pavements and entrances at la Savina's Illes Pitiüses park. 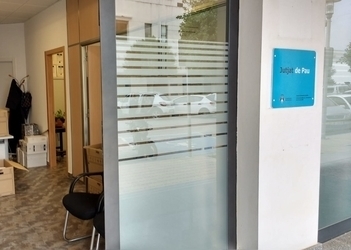 The Formentera Council announces that this week marks the christening of the local Justice of the Peace's new office space at 120 baixos, carrer Pla de Rei, next to the post office. Islanders can take care of all the same proceedings at the new space, like settlements, handling of notices, citations, requisitions and summons, not to mention delegating specific tasks to third partiers, as in the cases of letters rogatory from other courts or tribunals in civil and penal cases. For communications needs, a video-conferencing service is also available, particularly for investigators and witnesses involved in cases with other Spanish courts. Office staff also provide relevant forms and consulting on the range of formalities relating to courts and the Spanish ministry of justice. The office also serves as a Civil Registry for births, marriages, deaths or other events; processing of marriage requests; civil-union ceremonies; formalities required for births not registered during the established time period; transfers of birth and marriage certificates; information updates; name changes; delivery of proofs of identity and civil status, etc. 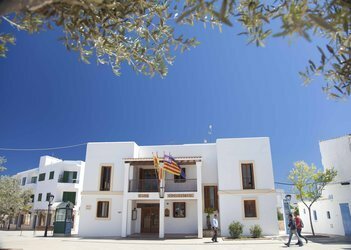 Formentera's Justice of the Peace (Jutjat de la Pau) opens from 9.00am to 1.30pm, with additional hours available as necessary. An on-site procedural consultant is empowered to act as a law clerk for the court of justice, a justice of the peace, and a substitute justice for public hearings which require the presence and imprimatur of such an individual. Recourse to the justice of peace is not only fast and free of charge, using it often allows individuals to forego the drawn-out and exorbitant procedures typical of other courts of law, such as by reaching amicable agreements for small claims. 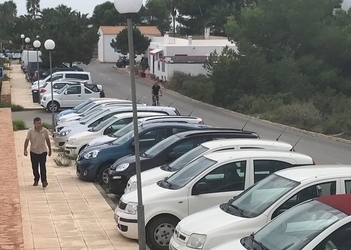 The Formentera Council's infrastructure office has convened a informational meeting to apprise Sant Ferran residents of looming upgrades on avinguda Joan Castelló i Guasch. 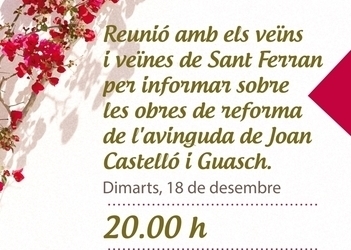 The gathering is scheduled for Tuesday December 18 at 8.00pm in the Sant Ferran seniors' centre (Centre Social i de Majors). The road work was outlined in the run-up to a similar meeting in 2017, when islanders were given a booklet containing a road map for the project. Tuesday's meeting will be primarily focused on explaining the particulars of the work set to take place. The planned upgrades on the avinguda (“avenue”) known as Joan Castelló i Guasch covers a range of pavement surface improvements as well as the undergrounding of services like sanitation, drinking water, telephone, electricity and street lights. Infrastructure councillor Rafael González promised the upgrades would bear similarities to work last winter on two local streets, or carrers: Guillem de Montgrí and València. Said the councillor, “At the time we did away with architectural barriers, expanded pedestrian walkways and implemented metred parking. This new project represents a continuation of the previous upgrades so that the entire town enjoys the same conditions”. The proposal also incorporates a dedicated bike lane along the length of the road and various electric-vehicle recharge points. Engineers plan to carry out the project in two parts, one this winter and one next. The four-month deadline of the first portion is intended to ensure completion in time for the 2019 tourist season. The Formentera Council's infrastructure department conferred drafting of a drainage project at Es Ca Marí that would involve a network of drainage pipes and connections to individual households plus pumps linking properties with the Abaqua station. The €12,000 project was awarded to Gradual Ingenieros. Abaqua, too, are now preparing a project involving waste water removal on Es Ca Marí's secondary network (or xarxa en alta—as opposed to “primary”, en baixa), and a study is in the works that could see creation of a pump station to accommodate the primary grid, which is administered by the local government. Es Ca Marí, zoned for some two thousand units of tourist-use lodgings, is classed as urban land under island regulations. As Infrastructure secretary Rafael González observed, “this is a tourist area which has needed sanitation for some time”. González said his department awarded the project as soon as Abaqua assured them the island's treatment plant could handle connection with Es Ca Marí. Once the first draft is complete, the Council will call a meeting with area residents to share details and encourage comments.